For most of us civil engineers, our involvement with the California PE Board (BPELSG) is limited to our initial application and testing to gain a professional engineer license, and then paying our biennial dues. Our formal interaction with our Board of Professional Engineers does not often need to be anything much more than just that. The BPELSG has however frequently requested the input of civil engineers on matters that concern us. In turn, they would like all our ASCE members to know what the BPESLGS does, to help ensure the integrity of our professional engineer licenses. One easy way to begin to know what the BPELSG gets involved with, beyond collecting dues, is to read their “Bulletin”, http://www.bpelsg.ca.gov/pubs/bulletin.latest.pdf. This bulletin is a quarterly newsletter, per the seasons, Spring, Summer, Fall and Winter. Within the Bulletin each quarter are one or two featured articles, in addition to regular newsletter items which include a “Message from the Executive Officer” (currently Ric Moore), Board News, Outreach Events, and the Board Calendar, amongst 18 other regular items. During these past two quarters, Fall and Winter 2017, there was a very interesting three-part feature article (one part per quarter) entitled “Mud Creek Landslide: Board Licensees in Action”. The Mud Creek Landslide occurred on May 20, 2017 on Highway 1, near Big Sur. The landslide buried and basically removed a ¼ mile segment of Highway 1. It is the largest landslide in California’s recorded history! To restore the roadway, the California Department of Transportation (Caltrans) employed professionals in Engineering, Land Surveying, and Geology to form a team that determined the safest, yet timely and cost-effective plan, for restoration of Highway 1. It is an exciting article that highlights the initial analysis (geotech and surveying and engineering) of the site, through to planned restoration. Part one highlighted one of our fellow licensees, a Professional Land Surveyor from the project; Part two highlighted a Professional Geologist; and the final segment will highlight a Professional Engineer. This three-segment article really reminds me of how we rely upon our fellow professionals in a project to make a team to formulate the best plan for the situation, and I would highly recommend that you read the BPESLG Bulletins regularly. I would also suggest that ASCE members should seek to attend one of the regular BPELSG Board meetings during the year. The meetings are normally held monthly, and in locations around the state, from San Diego, to the Bay area and Sacramento. The agenda and meeting materials are available prior to each meeting at http://www.bpelsg.ca.gov/about_us/meetings, along with the full schedule of meeting dates for 2018. 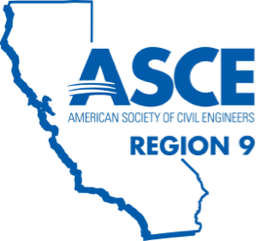 The ASCE Region 9 BPELSG endeavors to send a representative to each of these meetings as well. 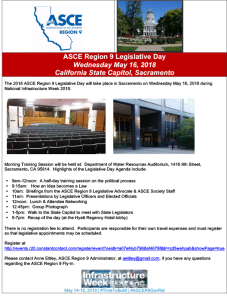 If you have any questions or need further information about the ASCE Region 9 BPELSG Committee, please feel free to contact me at Thor.Larsen@hdrinc.com. The Geo-Institute is a specialty membership organization within American Society of Civil Engineers (ASCE). Members of ASCE Geo-Institute benefit from a strongly connected network of geotechnical engineers, geologists, seismologists, scientists, and students. They meet on a regular basis to foster an exchange of technical development in the field and to share recent project experience. The January dinner meeting topic was about the Regional Connector Transit Corridor Project, tunneling and deep excavations in close proximity to structures in Downtown Los Angeles. This $1.4b Regional Connector Transit Corridor design-build project is a 1.9-mile-long light rail transit project in downtown Los Angeles. The project includes approximately 4,900 feet of twin bored tunnels together with a mined crossover cavern, 3 deep stations, and other cut-and-cover structures. The presentation provided an overview of the project, its challenges and insights of the design-build process; and provided an update on the on-going construction. The speaker was Dr. Hong Yang, P.E., G.E., P.G., C.E.G, a Principal Engineer with Mott MacDonald. The February dinner topic was about the most recent research on Seismic Response of Mechanically Stabilized Earth (MSE) Bridge Abutments in California. The MSE Bridge abutments have been used in many locations throughout the United States due to the advantages of lower cost and easier construction over traditional bridge abutments, however, their seismic response and the interaction between the bridge deck and the MSE abutment are not well understood, which have limited their use in some states. The presentation demonstrated a series of laboratory tests from ½ scale MSE bridge abutments excited by several earthquake motions on a shaking table at University of California San Diego (UCSD). The experimental results confirm good seismic performance of the MSE bridge abutments and provide some preliminary insights into their seismic design approach. The preliminary validation of numerical simulations in FLAC 2D using the experimental results were also presented. The speaker was Dr. John S. McCartney, P.E., Associate Professor at UCSD. The March dinner meeting topic was The Oroville Spillways – Geology and why it Matters. On February 12, 2017, during operation of the emergency spillway, rapid, deep head-ward erosion was observed in the northern portion of the unlined emergency spillway, which caused evacuation of more than 180,000 people. This presentation discussed the geologic conditions that were understood at the site prior to construction, the geologic conditions that were documented during construction, and what was learned about the geologic conditions since the spillway failure. The speaker was Ms. Holly J. Nichols, P.G., C.E.G., Senior Engineering Geologist with California Department of Water Resources, Division of Engineering. To learn more about the ASCE San Diego Geo Institute Chapter, please contact Lydia Marshall at LMarshall@sandiego.gov.